This is a very interesting post. It is indeed fascinating to look at the historical meanings of terms like 'courtship' and 'dating', but you don't make any effort to include what the terms mean in usage today. In general, people use 'dating' to mean pursuing a series of casual (and most often immoral) romantic relationships, and 'courtship' to mean seeking a spouse. That is a major difference. Yes, there are many, many ways people interpret and use the terms nowadays, but that is the basic difference, and you shouldn't acuse people of using the words in ignorance just because they don't have the same meaning as they did historically. (Although as you pointed out, calling something by a different name is no excuse for folly, and parents ought to know better.) And don't you think that by saying 'traditional morality' people are just referring to the concept of pursuing chastity - they aren't claiming to be following some set historical model of 'wooing'? Give people a little semantic slack. :-) On the other hand, your systematic 'here's how I think it should work' gives excellent advice and outlines what I thought was generally meant by the the word 'courtship' today. Great stuff. I agree 100%. You're quite right that the obsession with finding one's pre-ordained soulmate is unbiblical, untraditional and all-round unwise. Yet that is the main focus of even a pretty smart young adult website like wwww.boundless.org or books like "I Kissed Dating Goodbye". Anyways, thanks for writing that. I'm marking it to follow-up and re-read. I have sons about to enter this phase. This was a great post. I often hear the "traditional" label slapped on modern courtship rituals, as if it was an argument in favor of them, and it's always irked me a bit. Love the Tolkein quote. Do you have a source? I appreciate much of what you said. However, you should know that I - anonymous I know - feel the need to say that I disagree with some of your opinions with regards to marriage as 'vocation'. While you're right to wag a finger at those who wait years to find their soulmate as if they were chosen by your guardian angel, I don't think it is "traditional" to dismiss love-talk, and finding one's proper place in God's plan as a married man or woman, with a particular man or woman, because you love them and they love you. There's more to marriage to be sure, and I'm sure you agree with me on some level here, but I do think you are downplaying something essential here. The traditional formula was "marriage therefore love" not "love therefore marriage". We ought not to dismiss love-talk but we ought to downplay the importance of love before marriage. If anything, such strong emotions create obstacles to prudent, thoughtful decision-making. If a spouse is well-selected, love will grow. And this love, since it is set on a good foundation, is more likely to weather the peaks and valleys of conjugal life. I don't think there's anything wrong with talking about marriage as a vocation. Marriage is a sacrament as much as Orders. It requires special graces to be a husband or wife, and to be an apostle to one's children. St.Francis de Sales calls marriage a vocation many times and he can hardly be called modern. On the other hand, there is a danger in equating the two vocations, as though they were equal in dignity. Our Lord said of voluntary celibacy "He who CAN accept this, let him accept it". It is much like joining the military in a time of war. If you are able to bear the burden of priesthood, one should not be asking oneself "Am I called to marriage" but "Why should I NOT be a priest?" You hit the nail on the head. We certainly don't want to say love is not fundamental - obviously love is a very essential element to marriage. But the place of love is misunderstood. Also, as I said in the post, of course thelogically speaking, marriage is a vocation, in the sense that God has a plan for our lives and we want to fulfill that plan. But it is not the type of vocation that people often make it out to be, and we certainly don't want to equate it with priesthood. You said it best: "Why NOT a priest?" "Because God doesn't want me to be a priest...I think." I don't think he said it best at all. The default for all humanity seems to be the married state, unless of course God asks something above and beyond that sacrament, calling one to holy orders or religious life. Asking oneself "why not" presumes that God wants all men to be celibate, to make themselves eunuchs, even if for the Kingdom, which hopefully people get married for as well. If anything, this kind of thinking is what got the Church into thinking that vocations were flourishing in the 30's to 60's, when really, only a percentage of vocations were actually genuine and truly pleasing to God. Someone who knows Greek will have to do this work for me, but I would be curious to know what the Greek reads when Clavem quoted Jesus saying "He who CAN accept this, let him accept it". Something is being misplaced here, and it is not dignity of the priesthood in contrast to marriage. As for the place of love, it neither should precede marriage, or proceed after it. As for the alleged "traditional formula" when it comes to marriage (substantiate this please), what exactly is meant by "marriage therefore love" and "love therefore marriage". How we interpret these can make for very different understandings of the role of love in marriage. I shouldn't have to spell it all out for you. You should define your terms and phrases explicitly. My RCIA classes always marvel when we get to the class on the Sacrament of Matrimony and they see that “love” is not required for either the form or matter of the sacrament. Actually, love is required for all of the sacraments. Indeed, it is required for the entirety of the faith because that is what the faith is, that is what God is -- Love. Now, to be sure, the contemporary and modernistic concept of "love" -- the love of feelings and urges and longing -- is not required for the sacrament, but true love, the love of making a conscious choice to make a total and unconditional gift of self and selflessly seek the good of the other, the kind of love that can be the subject of the required vow and promise, the kind of love that is Christ Himself, that love is central to the Sacrament of Matrimony, including both the form/words and the matter/body of the spouses. It seems to me that, if the Renaissance/Medieaevals/Victorians had any recorded opinions on the (im)prudence of "marrying for love", then it must have been a well-known phenomenon, even if met with scepticism. On the other hand, I've not many case-studies handy to judge the relative successes of different strategies. And furthermore, Love is a commandment! You're supposed to love everyone you meet, whether you marry them or not: most of the time, you won't. And I don't think I'm (entirely) equivocating on "love" here. I had recently visited a web site www.cultel.com and read with great interest the prejudice against women especially the unmarried and unprotected duRing the middle ages in Malta. My point is that comparisons of past with present will only count when one considers the demographic variables plus others that fits in the formulae. Obviously, there is always different perception of how people visualise a situation, but this could always be factorised with statistics. I therefore urge you to read this article related to inquisition times in Malta. I think when dating, it is important to get to the point where one can say "I could grow to love this person" but I do not think it is necessary or even wise to come to the point where one is "in love" before marriage. Regarding celibacy, the literal translation from the Greek has it "he who is able to receive [it] -- let him receive"
Paul teaches the same thing. "It is good for them [unmarried and widows] to remain as I am [celibate] but for those who lack continence, let them marry"
I would refer you to the Summa on the subject of the superiority of virginity over marriage, which itself quotes Jerome and other authorities. I would insist that "Why NOT such-and-such-a-religious vocation?" is still a valid question to ask oneself and not one that leads to false vocations, displeasing to God. The eras you mentioned that seem to have produced many false vocations had other factors involved. The priesthood was a respectable, safe, easy career choice for a lot of people. Often children were pressured by family to go to seminary or pressured to continue. This is not at all what I had in mind. And also, I do not think that God wants all men to be celibate but all men should try to explicitly rule it out as it is the more excellent path. What I have in mind is looking for signs of vocation, not just in feelings and emotions, but in the tangible gifts and graces given to you prior to this moment. Nobody is going to think "I'd make a great priest" but they might be able to look at themselves at say "I think I could bear it". Lastly, what do you mean that love should neither come before or after marriage? Thank you! I liked everything you said except for the part about love not being necessary. Could you clarify: Do you feel that the couple ought to have fallen in love before they make vows to each other? Also, keep in mind the definition of love given by St.Thomas Aquinas: to love is to will the good of another. It is an act of the will, not of the affections. In this sense, love is required for a marriage to be valid, otherwise the vows would be made in bad faith. It is similar to the situation where one spouse hides the fact that he or she is sterile but takes the vow to provide children for the other spouse - the validity of the marriage might be called into question. Cool blog entry - are there a scholarly references you could give me regarding the origin of the "wooing" sense of "courtship" in 1596, and how it later came to have more respectable connotations? Of course, practically speaking you are right - love is a "practical" necessity for marriage to work. It is true that, canonically speaking, love is not necessary in order to contract a valid marriage. 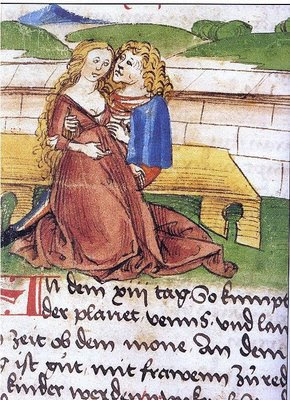 Historically, love was usually considered secondary - people who married out of love were considered rash. So, yes, love is a practical necessity for a happy, successful marriage, but it is not a canonical necessity. Two persons can contract a valid marriage with no love. It is written from a radical, protestant, and theonomic perspective: ie; what does scripture say about the issue. I would covet your comments. I will reply more here as I have opportunity. However in quick reply to the last issue, Eph 5 makes it clear that marital love is not some external object about which we have no control, but is something we are commanded to do. Going then to I Cor 13 we see the things we are to do in order to correctly practice the love we are commanded to have.
" I’ve said this before: withholding your child from dating until they are 18 or 19 is not traditional morality." Our entire society has been slanted toward pursuing novelties and delaying having children as long as possible. The prime biological years (later teens and twenties) are now for fun rather than having babies. Its virtually impossible for a couple to date for 5 years travel, etc and then not break God's law. if favorable answer continue, if unfavorable stop, end of story, no go period its not Gods will. 3) is it within your power or capacity- education, money, maturity, etc to do so? Actually, in relation to a previous comment on here there is biblical evidence for spouses being predestined by God. In Tobit, St. Raphael says to Tobias.. "Do not worry. She has been set aside for you since before the world began". I think this scripture puts a whole new dimension to what is going on. Since I discovered this I do now look for signs, but in prayer.